The Konnektor promises mastering engineers the drag-and-drop simplicity and recall of plug-in remote control. Even in this ‘Age of the DAW’ many of us still have analogue outboard that we like to route signals through for a bit of polishing, but the more outboard you use, the harder it is to integrate with a DAW. 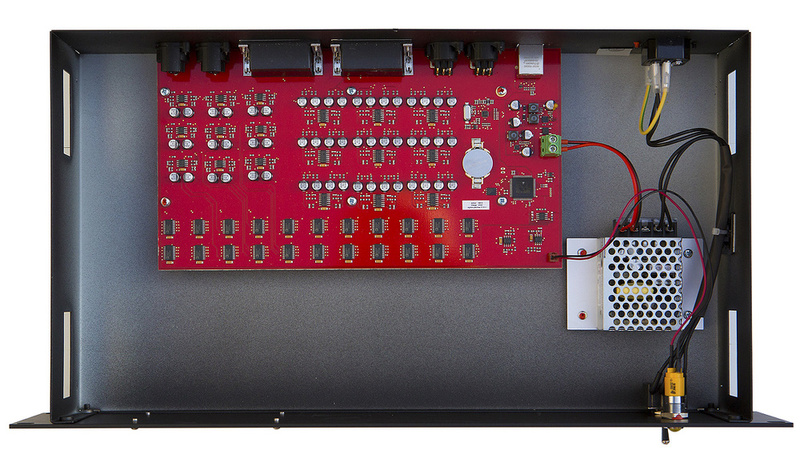 A traditional solution is to use a patchbay, manually connecting the equipment in any desired order, and for small-scale systems it’s often quite practical to connect a few outboard units permanently into spare I/O channels of one of the larger multi-channel computer interfaces, with the actual signal path being constructed using the interface’s control panel or the DAW’s built-in routing facilities. 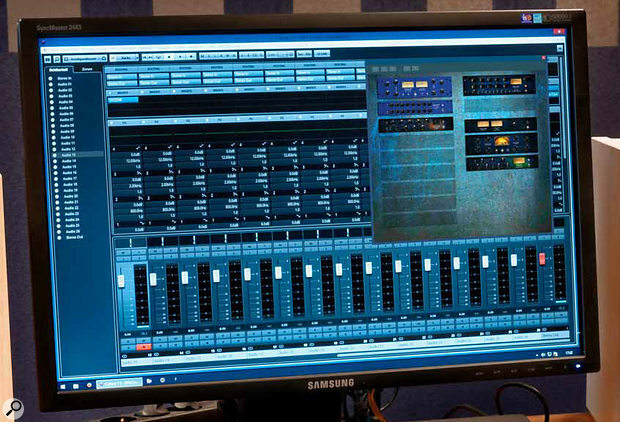 In most mastering rooms, though, the preferred solution is to employ some kind of matrix switching system, with all the outboard hard-wired directly into the matrix, enabling the user to decide which units are connected into the signal path and in which order. Indeed, this is the approach taken with my own Crookwood M1 mastering console, which allows up to three analogue and three digital signal processors to be patched in to the signal path in more or less any order. The obvious downside of these kinds of matrix systems is that they are external to the DAW and thus the routing configurations cannot be archived easily as part of a DAW project.This is where German manufacturers Tegeler come in, with their Konnektor mastering matrix unit. This 2U rackmounting device connects to the DAW system via a stereo analogue input and output, while enabling up to eight stereo analogue outboard devices to be patched into the signal path in any desired order. It can even handle conversion to and from the Mid-Sides format if required. Unusually, this matrix is controlled via a TCP/IP network connection, either through any web browser using the Konnektor’s own built-in web-page host, or, importantly for DAW users, from a plug-in which comes in VST, AAX (Mac/Windows) and AU (Mac-only) formats. Both the web and plug-in controllers allow routing presets to be saved and loaded, but the plug-in version can also be stored as part of a DAW project, instantly reconfiguring the outboard connections when a project is loaded up. Each of the outboard inserts can also be named and images uploaded into the unit to customise the system’s appearance and enhance its ease of use. To accommodate the large number of inputs and outputs, Tascam-format 25-pin D-sub connectors are used. The Konnektor ships in a foam-lined wooden crate covered in stencilled company logos for a bit of retro kitsch. For this review, the manufacturers also sent along the optional set of breakout cables, each packaged in a rough hessian bag, adding to the rather quaint presentation. The unit’s blue front panel has a rather more modern look, with the product name emblazoned across it, albeit partly hidden with a faux-retro specifications plate. The only front-panel control is a large on/off toggle switch with an associated yellow lamp. 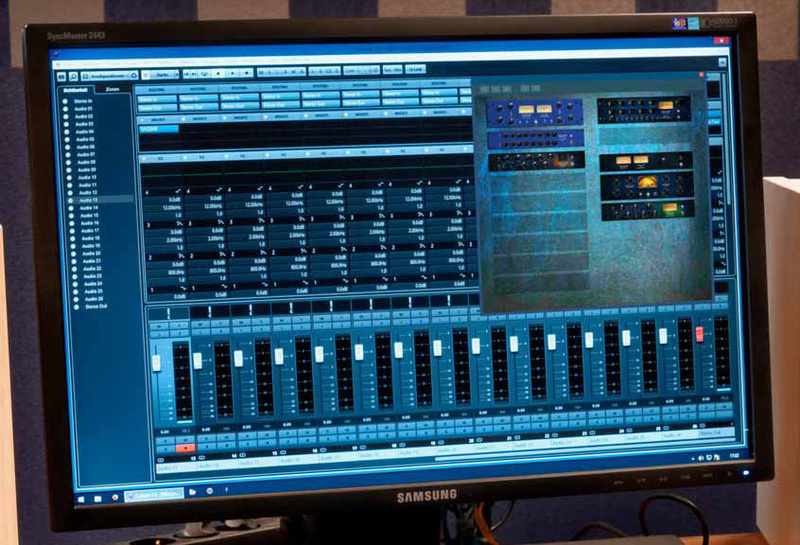 The graphics can be customised with imported photographs of the user’s own selection of outboard.The rear panel is not much more complicated, with two pairs of XLR sockets for the main stereo analogue inputs and outputs, which connect to the DAW’s interface. Up to eight stereo outboard devices are connected via standard AES59 (Tascam) D-sub connectors, so there are four 25-way sockets on the rear panel to accommodate the 16 audio insert channels. I should emphasise here that, although the Konnektor is, technically, an 18x18 matrix, all the signal paths are switched in stereo pairs at all times. A single 10/100Base-TX Ethernet port is provided for the unit’s remote control, and an IEC inlet accepts mains voltages between 110 and 240 V AC. 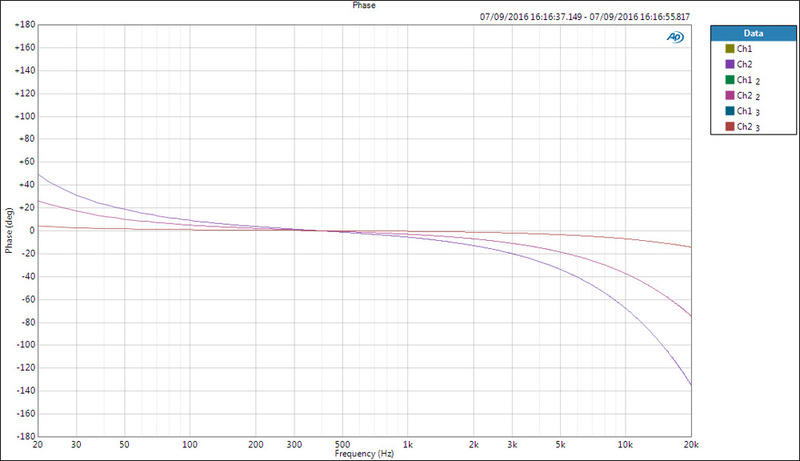 Power consumption is less than 25W, and the unit extends 250mm behind the rack ears. 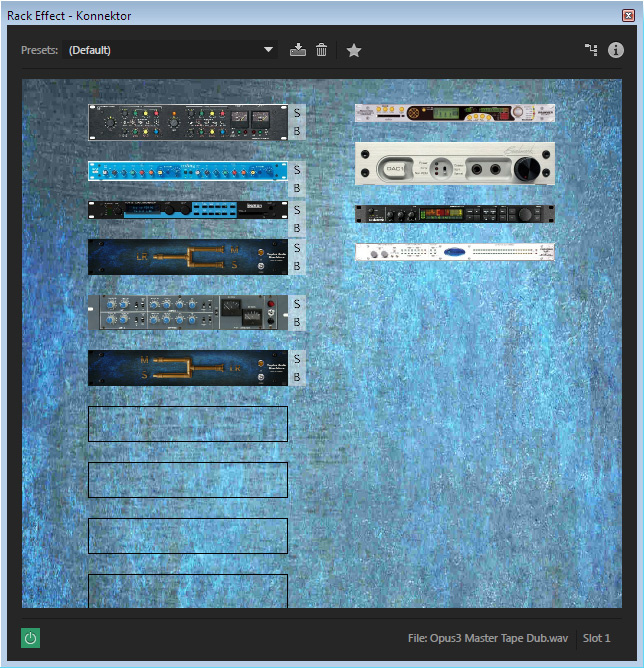 Both the plug-in and web host controllers are laid out in the same way, with a column of up to eight external outboard units on the right-hand side, shown as graphical front panels, plus a pair of built-in M-S encode/decode converters. A similar set of matrix slots or insert points occupies the left-hand side of the screen, and configuring the matrix is simply a case of dragging any processors into the slots in any desired order. Although there are only eight outboard unit connections, there are ten slots, so as to accommodate the built-in M-S encode/decode processes when required. The plug-in version of the remote control software, featuring graphics for Tegeler’s own outboard. To change the routing, you simply drag and drop from the right to a slot on the left, or from one slot to another. Although it’s unlikely that both the internal web-page controller and plug-in would be simultaneously active for most users, they were when I was first setting the unit up. As a result, I noticed that changes made on the web browser were reflected instantaneously in the plug-in, but changes made in the plug-in weren’t displayed in the browser unless I refreshed the browser page. That’s not entirely surprising, perhaps, but something to beware of. 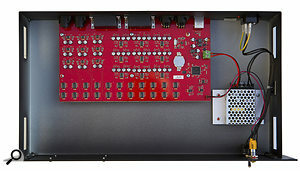 In its factory condition (which can be reinstated at any time), the plug-in and web page are pre-loaded with graphics for eight of Tegeler’s own outboard processors (some of which are also remote controllable via their own plug-in, bringing the tantalising prospect of entire analogue processing chains being stored, recalled and auditioned within your DAW session). However, these can be replaced and renamed by uploading into the unit any user images via a settings tab on the internal web page. One of the screenshots here shows the image replacements I installed for use in my own system... with only a small amount of wishful thinking! As each outboard processor is placed into the matrix, its graphical image is supplemented on the right-hand side with tabbed letters ‘S’ and ‘B’. The ‘B’ tab activates a bypass of that specific unit, while the ‘S’ tab solos that unit, bypassing everything else. These facilities make it very easy to check and adjust each processor, as well as helping to assess the efficacy of a unit within the chain. Should it be necessary to change the order of processors, each unit can be dragged up or down the slots at will, with the audio signal paths being switched accordingly and virtually instantaneously. Audio signal routing is performed entirely with electronic multiplexers, so there are no distracting relay clicks. As I mentioned earlier, presets can also be stored for any configuration, and entire effects chains compared instantly just by recalling different presets. The web-page controller has capacity for seven presets whereas the plug-in can store an unlimited number. An audio matrix is, inevitably, a rather costly alternative to traditional patchbays, but it also has many practical advantages, not least being greater reliability and much faster operation. Disregarding my short-lived frustration when integrating the unit into my atypical local network, Tegeler’s Konnektor worked flawlessly. 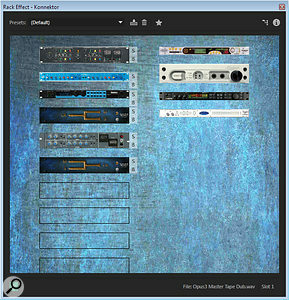 The plug-in and web-page controllers both work perfectly and are extremely intuitive. The audio quality is exemplary, too. I imagine some potential customers might be put off by the TCP/IP control format, preferring instead USB and/or MIDI interfaces... and perhaps the potential market would be larger had these interface options been included. Nevertheless, given a requirement for a device to control eight stereo, balanced, line-level insert points within a stereo signal path, with total flexibility and transparent fidelity, this product should be placed very high on any auditioning list, and perhaps at the top. I am very impressed with it indeed. The stand-alone form of the Crookwood mastering console matrix, the R3, has a similar degree of signal-path flexibility. So too do the SPL Masterbay 8 and the recently retired SSL X-Patch. For mastering applications, four other matrix/insert units come to mind, all of which have a more comprehensive feature set but slightly more restrictive signal-path structures: the Manley Backbone, the Dangerous Music Liaison, the SPL Masterbay S, and the Maselec MTC-1X. SKnote’s Catena could also be considered, although it has a rather different feature set again. The phase response changes according to the number of insert slots being used.A routing matrix stands or falls on two things — ease of use and audio fidelity — and the Konnektor excels at both. 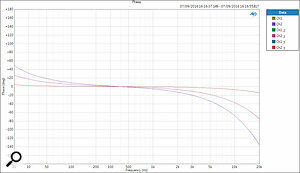 I checked the technical specifications with an Audio Precision test system and found excellent results throughout. The worst-case audio bandwidth is 12Hz to 32kHz (-3dB points) with all eight insert points active, extending to 9Hz to 45kHz with just four inserts. It’s inevitable that the bandwidth will change slightly depending on how many insert points are active, although the chances are that it will be the external outboard that serves as the limiting factor here. Needless to say, the response was also ruler flat, with very tight tolerances between channels — the worst-case error was below 0.25dB. The phase response also changes with the number of active inserts, with the worst case with eight being +50 degrees at 20Hz and -135 degrees at 10kHz, falling to +25 and -75 degrees with four, and +5 and -15 degrees with everything bypassed. As per the main text, the distortion, which is always low, is dependant on the devices you’ve hooked up to the Konnektor. The THD+N distortion figure was never more than 0.01 percent with all eight inserts running, and exactly half that with four insert points active. 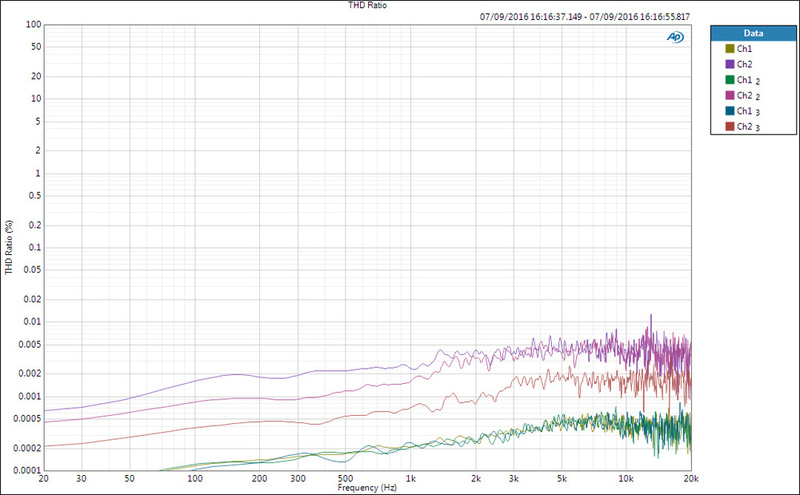 The only parameter I couldn’t quite match up to the published specifications was the dynamic range. 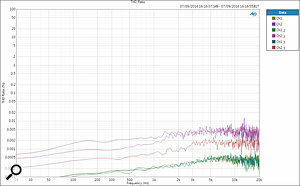 Relative to +4dBu, the signal-to-noise ratio varied between 96 and 83 dB depending on the number of active inserts. As the maximum input level is +22dBu, that equates to a dynamic range of 101 to 111dB (the specs claim greater than 110dB for all settings) but, again, I suspect the connected outboard equipment is more likely to be the limiting factor than the Konnektor itself. Interestingly, although the specs claim a maximum input level of +22dBu, I found it would tolerate a few decibels more, but only as long as the built-in M-S encode/decode facility wasn’t being used. It seems the circuitry employed for this task doesn’t quite have the same headroom margin as the switching devices and, consequently, starts to get rather ‘crunchy’ above +22dBu. Crosstalk between the left and right channels at 10kHz, even with all eight inserts running, was better than -80dB (ref +4dBu). The load impedance for all inputs is more than 10kΩ, and the output impedance less than 600Ω, which won’t cause any interfacing difficulties. Inside the box: all switching is via electronic multiplexers, which avoids annoying relay clicks. Internally, there’s a lot of empty box; all of the audio and control electronics and I/O connectors are accommodated on a compact PCB carrying only SMD components. A small OEM switch-mode PSU module is mounted alongside the main board, and there’s some mains wiring between the front and rear panels. The standard of construction is very high. Audio is switched using Analog Devices ADG426 multiplexers, and a mixture of TL072 and 074 op-amps are employed for signal buffering and for the Mid-Sides encode/decode functions. The audio switching and web host is all handled by an STM32 ARM microcontroller, with a CR2032 backup battery to maintain settings. Very intuitive DAW plug-in/web-page remote controllers. Ability to customise controllers with renamed inserts and uploaded processor images. Electronic switching — no relay chatter! There’s total freedom in allocating the insert-point order. TCP/IP setup not quite as automatic as it could be. 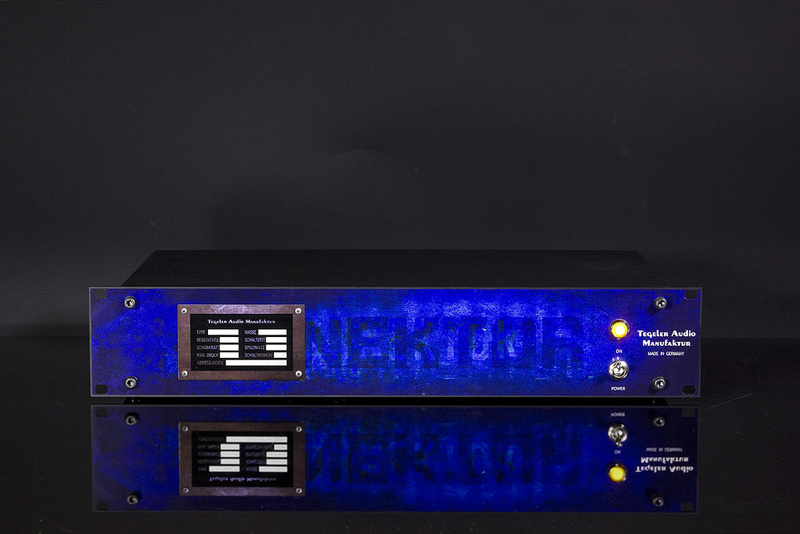 The Konnektor is a dedicated and very high-quality stereo analogue audio matrix system, with eight stereo insert points freely assignable in any order, and built-in Mid-Sides encode/decode facilities, all controlled from DAW plug-ins and/or its own web page. Tegeler Audio Manufaktur +49 (0)30 49 79 26 74.